VMworld for me is always a very hectic time. Usually multiple sessions, customer meetings, briefings and just many conversations with readers and people you bump in to while going from one place to the other. I tried to do some live blogging, but with everything going on I did not bother. Especially Day 1 and 2 are special for a VMware employee as everything we have been working on is then usually revealed. Of course not all the details, as the keynotes would take days instead of hours. I did take a bunch of notes so I figured I would share it anyway, so lets dive in to it. Personally I was very exited about the Day 1 keynote, I really liked the personal touch that Pat gave to it and it really got me excited about all the great stuff that was still to come. I am not going to layout the keynote minute by minute, as you can simply watch the recording, but there were a bunch of things that stood out to me that I want to call out. The DJ that opened the keynote was great, very energetic and it really got the crowd excited, even before Pat was on stage! When Pat came he welcomed everyone and introduced 21 folks who have attended all VMworld in the US, afterwards I found out that there is actually 1 person who attended ALL VMworld’s, not just US but also EMEA (Marc H). All 21 received lifetime free passes to VMworld, congrats and I hope each and everyone of you will be able to attend many more in the future! Next up on stage was Ray O’Farrell and Kit Colbert. Kit recently joined the Cloud Platform BU as the CTO and Ray is VMware’s CTO. Not surprisingly I guess, but Kit mainly spoke about vSphere Integrated Containers and Photon. The demo that followed was interesting. It showed a new open source project called Harbor, which is a container registry, and it showed VIC. What impressed me is how it all integrated end to end, from the container down to monitoring, management and security through NSX for instance. Kit also spoke briefly about Photon Controller and the benefits this brings, very interesting concept which now also seems to support VSAN. Up next was Rajiv Ramaswami who is the GM for the Networking and Security Business Unit. Of course the majority of the conversation was about NSX. I was looking forward to this section as I personally haven’t looked much at the recently acquired Arkin, which provides deep insight in to traffic flows and patterns etc. Actually, part of this was also shown in the Day 1 demo, some may recognize the diagram below, which is similar to what was shown in the Cross-Cloud Services UI. Last up: Yanbing Li. Yanbing is our fearless leader in the Storage and Availability BU and it is needless to say that the main topic in this section was VSAN. Yanbing mentioned that VSAN now has over 5000 customers, and that VMware is adding 100 new customers every week. A couple of upcoming features were introduced namely: Encryption at rest (software based) and Analytics. Both of these features were demoed as well, but that wasn’t it. In the demo they showed how VSAN Analytics pro-actively informs the user that a workload should be migrated to an all-flash cluster to serve the needs of the app. Through vRealize Automation the VM was then migrated to a public cloud and also ended up on an encrypted VSAN datastore, all of if through policy. Very impressive, and I can’t wait for those new features to be available. Hopefully I can share more details soon. And that was the end of the day 2 keynote. 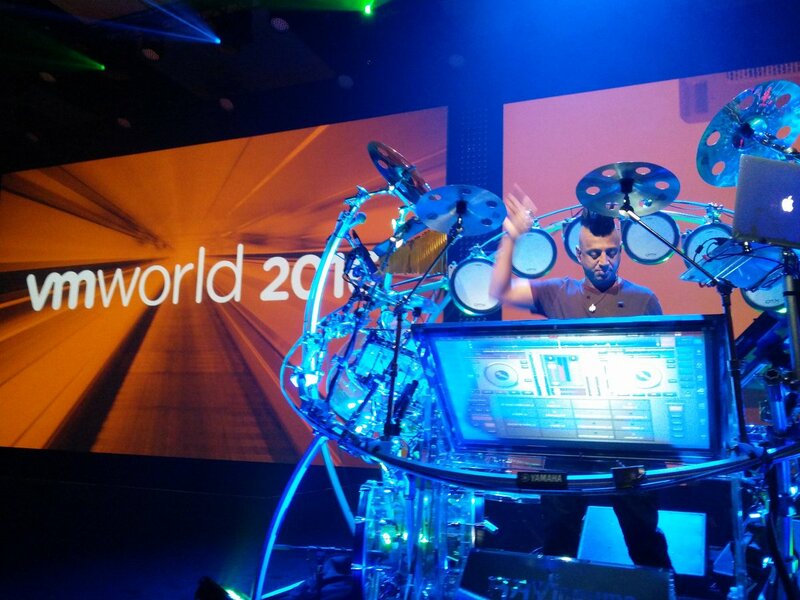 Some very cool new things shown, and apparently we can expect much more to be announced at VMworld EMEA.